I did an out-and-back ride of about 15 miles in July of 2005. I started at the campground and missed a turn and ended up heading back to Medora. Heading back to Medora was mostly downhill it seemed. 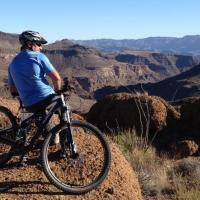 Review: Great trail for any XC rider. Well maintained and the signage was just to Keep on track. If riding in the summertime be sure to have plenty of water as it can be pretty hot. Review: We rode from Medora to the Buffalo Gap Ranch for lunch and beers, then rode back to town (about 25 miles total). Great scenery and the trail is well designed with good signage so you don't get off track. The bar was a nice oasis in the heart of badland country. 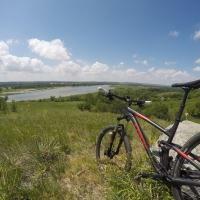 Review: Really fun trail, and probably my favorite in all of North Dakota! Rode this as an out and back, almost 20 miles total. Not anything too technical, although some uphills are long. A few creek crossings depending on the moisture level, so be prepared for that! Review: Pretty fun trail with some decent signage. I didn't find anything too technical on my short trip. Watch out for the "leaves of three," it seemed to like the shaded parts just off the trail. Review: This was a great trail. Not too tough, unless you ride it while it is muddy (which we did, inadvertently). The trail is sandy for most of the way then some of it goes through usually dry creek beds. It rained the night before and the creek beds were muddy and all of the clay based mud stuck to our wheels, brakes, etc. Still had a good time. We started at the campground and rode a short loop of about a mile or so first then took the twelve mile out/back. It was some breathtaking scenery. Since it is an out and back you get to ride through two prairie dog "villages" twice and they talk to you and each other as you approach and ride through. Very cool experience for me as a southerner/easterner. Also saw some elk or deer in the distance. They saw us first, took off running to a crest of a hill, stopped and watched us and when we got closer they took off again. This is also an open range with some cattle grazing in areas but they did not interfere with the ride at all. The photos we took were some of the best of our trip. 24 to 25 mile ride at an altitude much higher than Eastern KS and DC took a lot out of us but we enjoyed every minute of it. 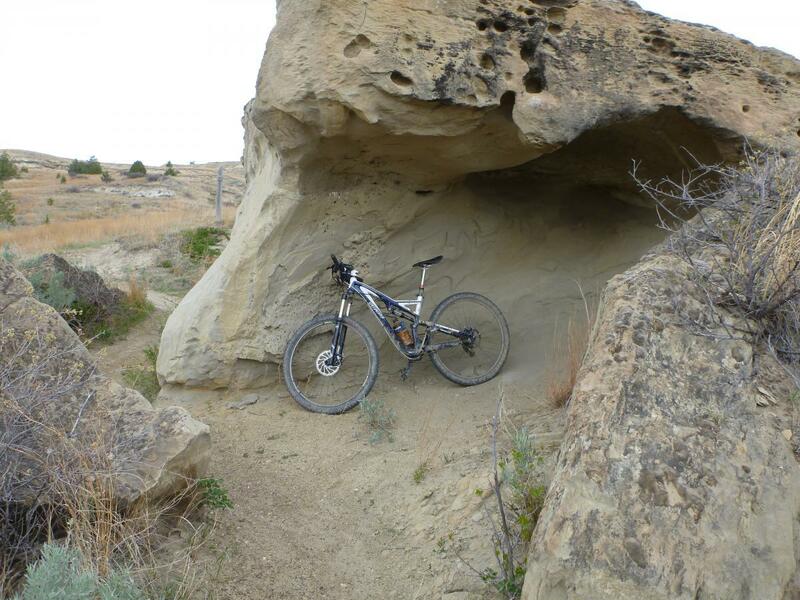 Review: I rode this trail as part of Maah Daah Hey. It's an intermediate ride if to do it out and back. Nothing really technical, but scenery is breathtaking. Trail very well maintained and it was the fastest portion. I will recommend Buffalo Gap for those who in the area. 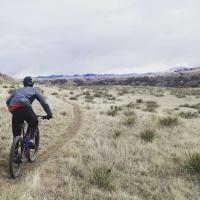 Review: Easy enough trail, very pleasant ride in a beautiful area. Review: This trail was a lot of fun. Not to difficult but deffinatly a good day. The trail is well marked so you shouldn't get lost. There is a few down hill sections but nothing to deth defying. The scenery is amazing. If you're ever in the area, i highly reccomend spending the day out there. Buffalo Gap Trail MTB Trail 3.63 out of 5 based on 8 ratings. 8 user reviews.